Sorry that this blog has been so long coming! 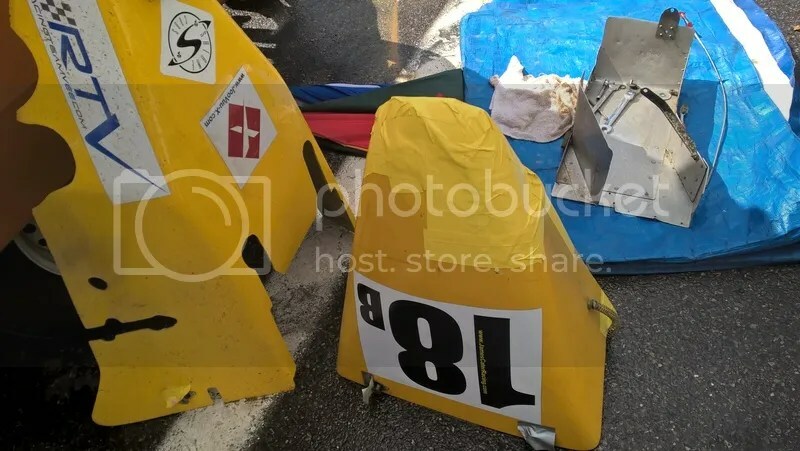 Unfortunately the major dramas that make up Real Life came into play, and my usual best escape of racing failed as that all turned out disastrous, too. That said, it was brilliant getting away for a few days to hang out with the other Vee drivers. I know a few of us have some huge things going on away from racing at the moment, and hope the distraction of racing helps them as much as it does me. After 6+ hours on the road, we arrived (early for once!) 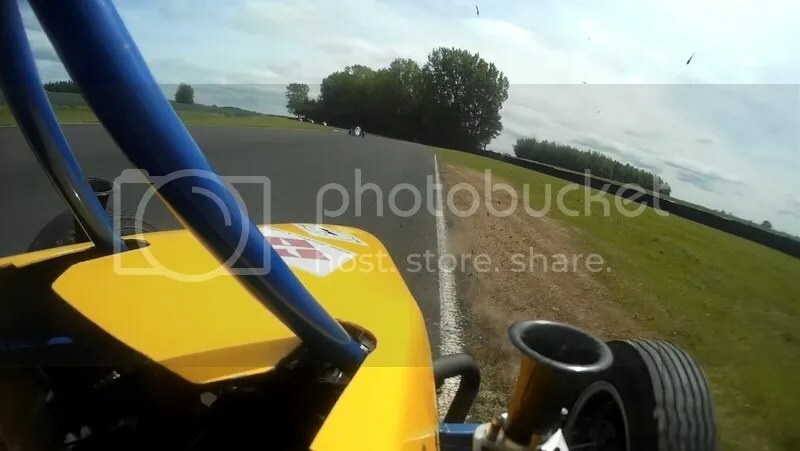 at Croft – one of my favourite circuits from last year. 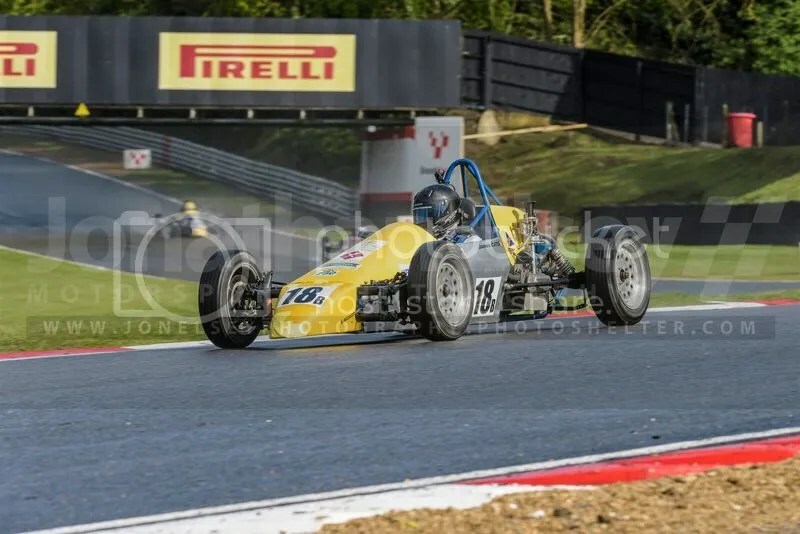 After the many hours spent fixing (and de-gravelling) the car since Brands Hatch, the brief was to keep the car safe and just get some points back on the board. I hadn’t done the sort of prep that I should have – watching videos, playing simulators etc – so started somewhat steadily in qualifying. When you’re not 100% sure where to break and turn in on every single corner, it’s amazing how much it adds to your lap times. 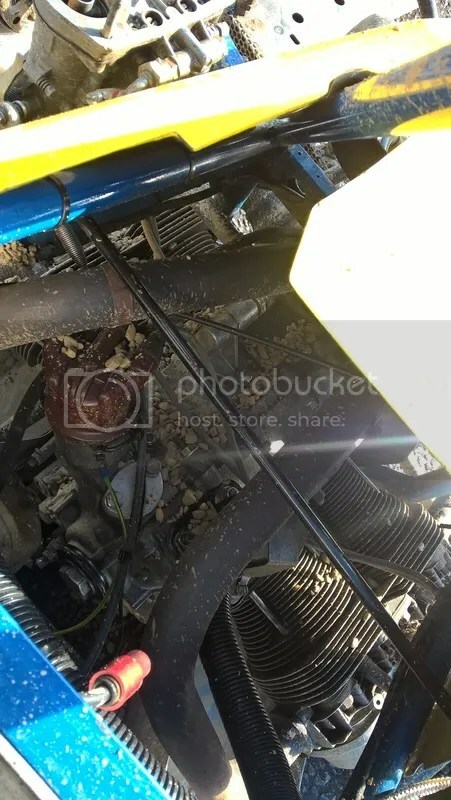 The car felt good, but then someone dropped oil around half of the lap on the fastest section all the way back to the finish and a few cars had spins. 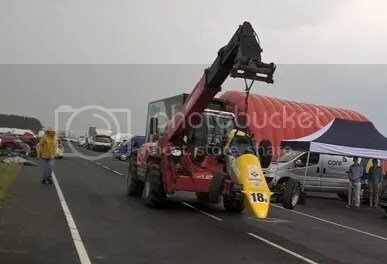 As ever, I’m enough of an idiot to enjoy a bit of oil, but obviously with oil down from the 2nd or 3rd lap this meant all those who’d practiced the day before got much faster laps in before the track was ruined. 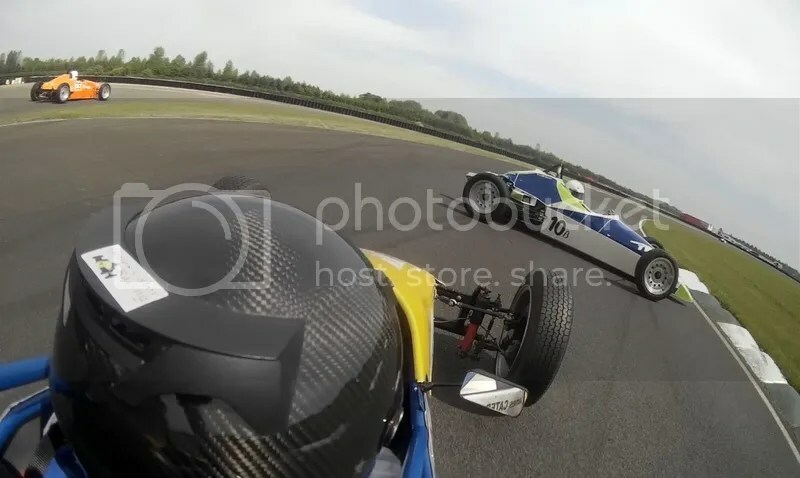 I actually put my quickest lap in on my final lap, despite lifting off to let Adam Macaulay and Ben Miloudi through on flying laps – so at least knew I was doing something ok! 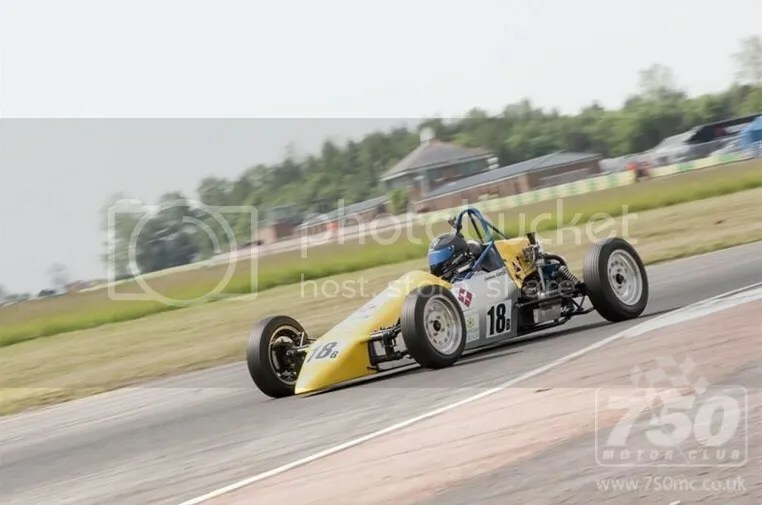 I qualified a mediocre 17th and 16th – but with James Harridge blowing another engine and Jamie Harrison losing all power this still put me 2nd in class right behind Colin Gregory for both races. The first class win was in sight! With another fast start I pushed a few places up the grid off the line, having to lift for a few slower cars but still making good progress. I got ahead of Mark Egan up the inside of the first turn, but then into the sharp Turn 2 I knew I could either get aggressive and perform a really harsh block pass on Mark, risking taking us both out, or back out as safely as I could, making sure I could hold the tight line around the corner. This would mean Mark disappearing on the exit, but I could live with that for now.. Unfortunately, Mark then cut hard across to the apex, I assume having not seen me, and leaving absolutely no room for me. 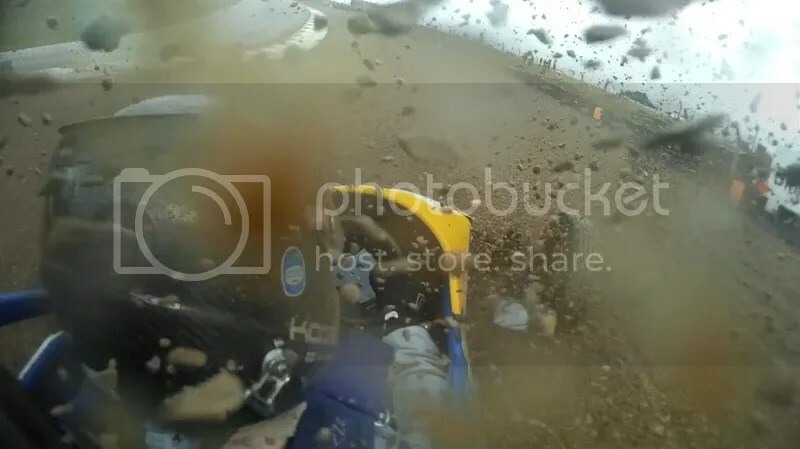 I slammed on the brakes even harder and got a nudge from behind from Peter Studer – but it was already too late and Mark’s right rear wheel slammed into my front left. 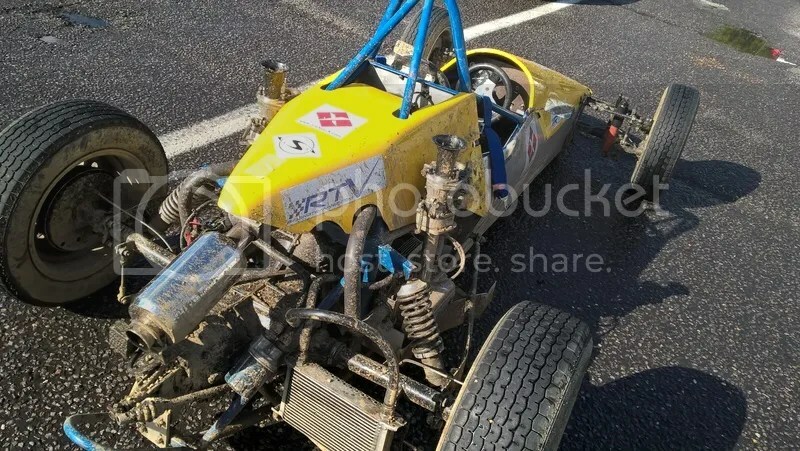 This broke the steering link, and as my wheel flapped around like some sad, dying fish, I was at the mercy of the rest of the field as I veered across the track and off the side to retire. Then, just as I got out and stood at the side of the track, it started thundering. Yeah, thanks for that. The car was carried back on a crane, and some hasty bodge repairs made ready for the next day. 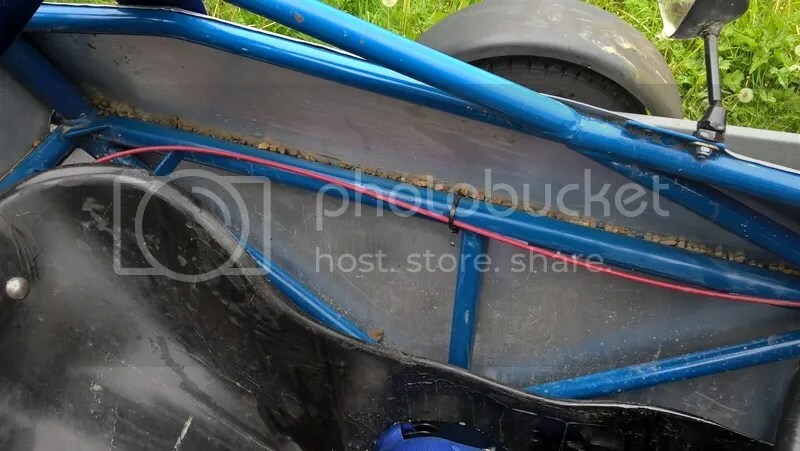 As we were making a start on it, Ian Rea spotted the impact had ripped the front beam off the chassis, stripping the thread and bolt holding it on. Gary Richardson kindly helped get the set-up as good as we could, but with camber, castor and toe all a bit wonky (we had to try and even things out by re-adjusting the good side!) I could tell I might have to drive around the faults for the second race. 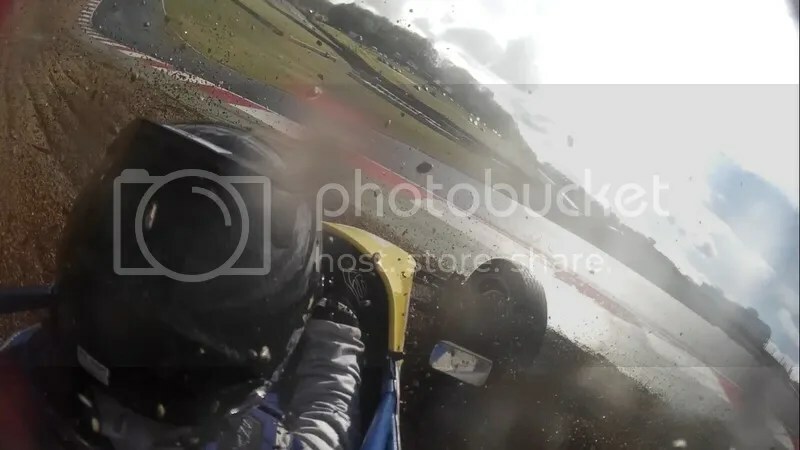 At Brands Hatch, I spun off into the gravel trap at Paddock Hill bend. Twice. 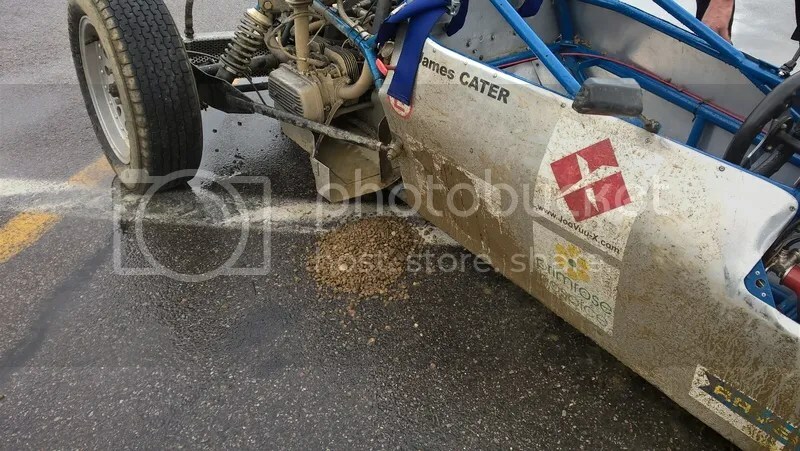 Whilst the gravel traps are brilliant, and undoubtedly stopped the car meeting the tyre wall at high speed, it still has some major consequences. When you see the BTCC cars spinning off and then rejoining, shaking off the gravel, what you’re not seeing is the hours spent stripping the car afterwards to get all the gravel out of it – not to mention the damage it does to panels and paintwork and sponsor stickers. Even after scraping out piles of the stuff, after trailering the car home 200 miles there was still masses of the stuff. Kilograms. All over the engine, literally filling the engine bay, and everywhere in the cockpit, too. 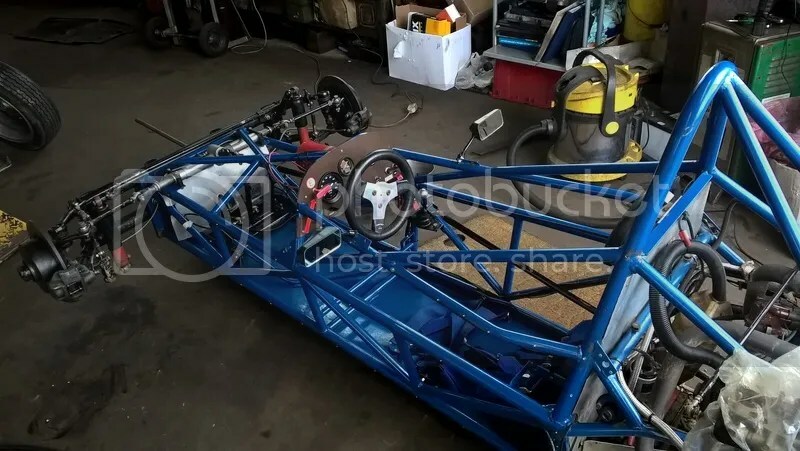 Vacuuming gets some out, but there is still masses behind panels and stuck behind chassis tubing, and the only real way to do it efficiently is to totally strip down the car. The original plan was to jet wash everything, but without one easily to hand James got out the sponge and soap and went over the car. Then we drilled out the rivets and got the side panels off to get at the rest of it, cleaning up the rest ‘dry’ using an oily cloth and more vacuuming. 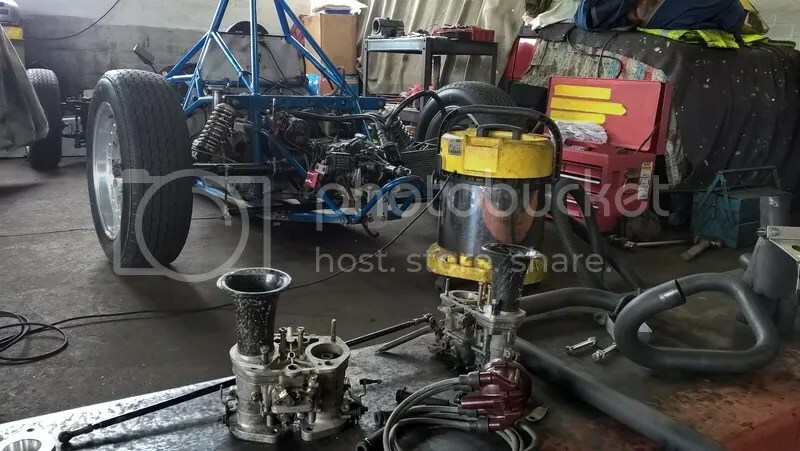 Next it was onto the rear of the car – Glenn found that he was unable to crank the engine over by hand, and so the engine had to come out. 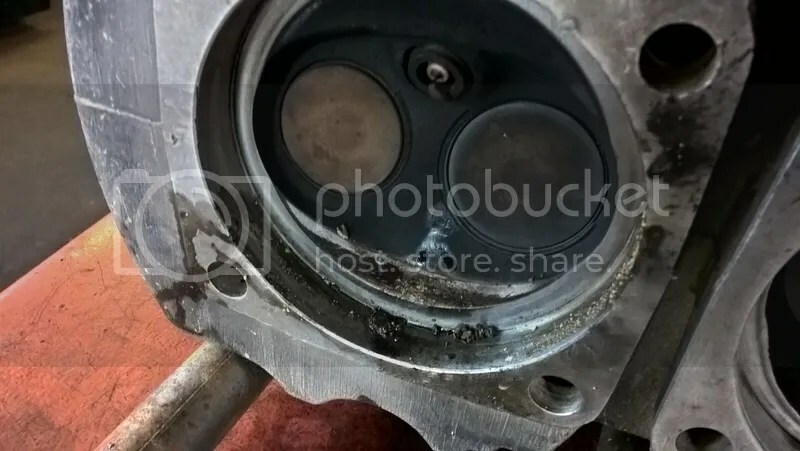 Luckily, once on the bench we found a pulped lump of gravel was blocking one of the pistons, and once this was removed everything worked again! 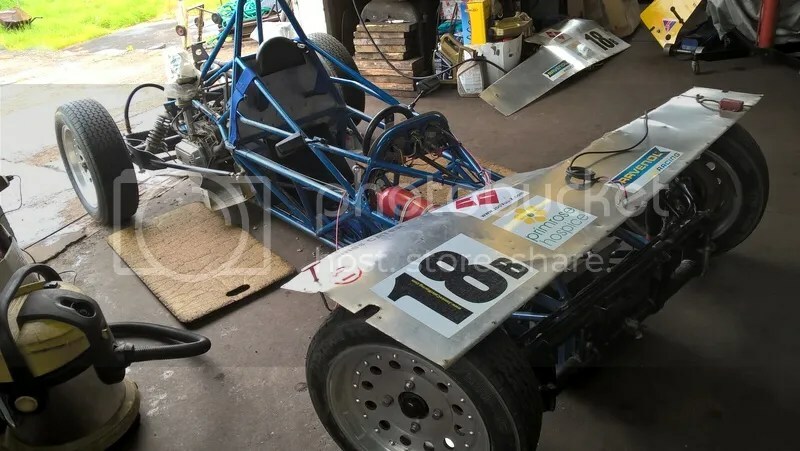 After more vacuuming and cleaning of the engine bay, the car is now ready to start piecing back together – there’s still a lot of work to do (repainting chassis and suspension parts, removing and applying new stickers etc…) but we should have it at least running ready to get to Croft at the end of the month. 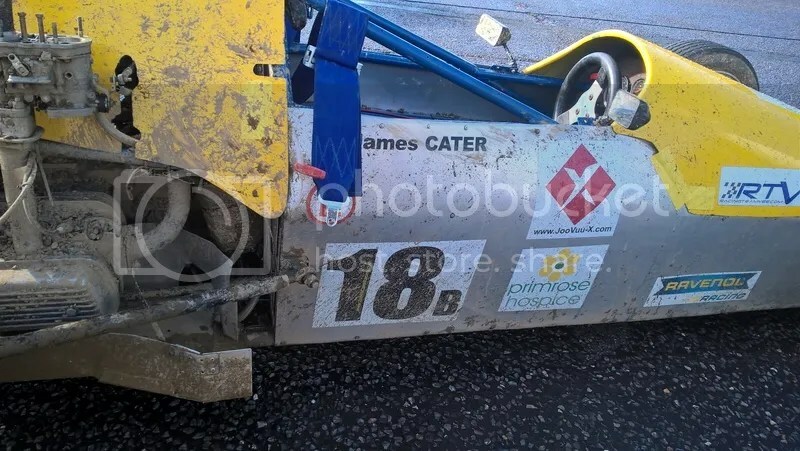 More drama, as the scrutineers had decided to check and seal our gearbox, and the only chance we could do that was right before the second race. I headed to the infield garages, taking all my kit and planning on going straight from there to the grid, if we could still make it in time. As I pulled into the garage the skies opened big time. 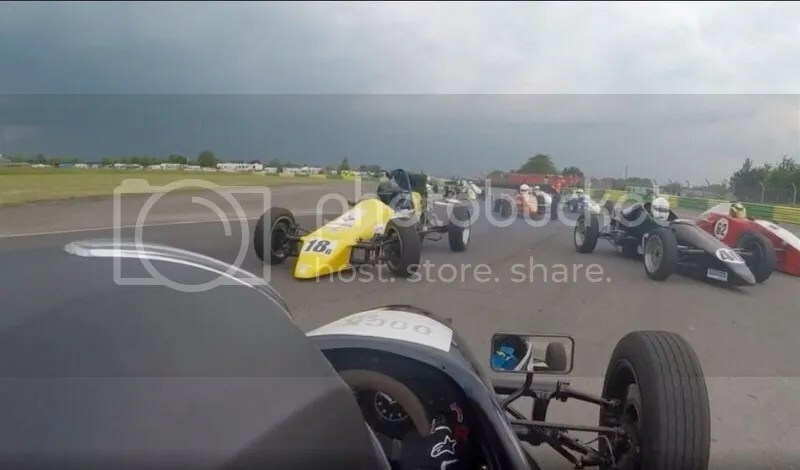 Racing was cancelled for a while as we had hail, the tunnels flooded, the pit lane became a waterfall/swimming pool, and other assorted skallywag behaviour came from the sky. This was, of course, because it saw me driving to the collecting area and thought the Vee race was about to start! 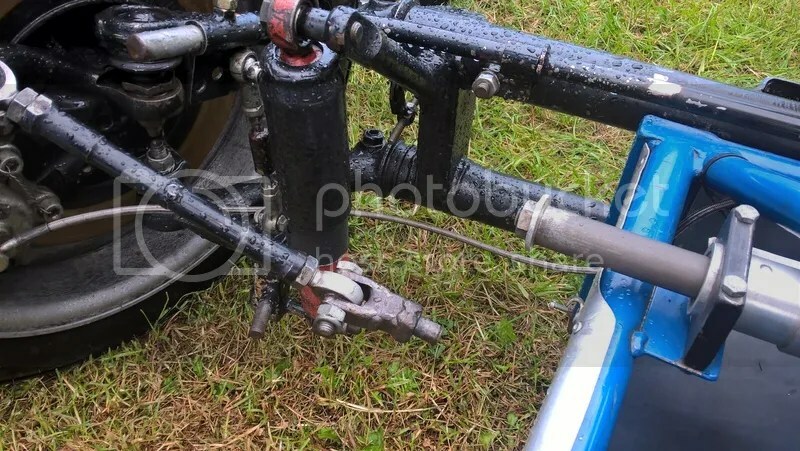 Eventually it settled a bit, my gearbox was sealed, and I took to the wet grid to try and salvage something from the weekend. 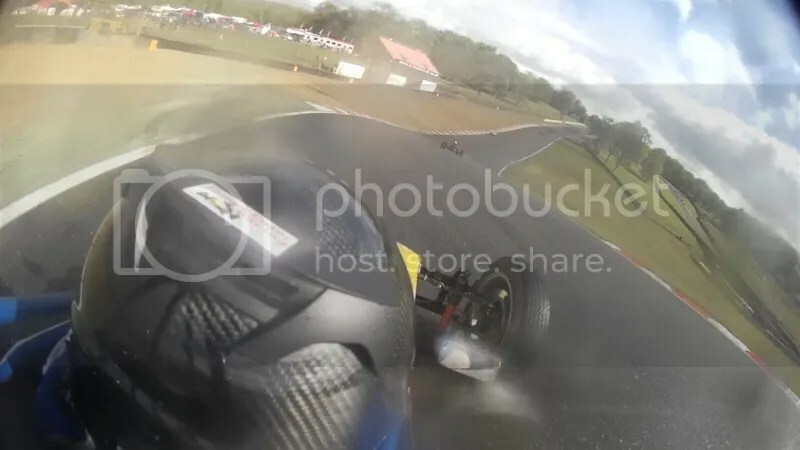 I spun the wheels a fair bit off the line, so had to get back off the throttle and didn’t make my patented rocket start – but it was still fairly decent and I didn’t lose out much and was right on the back of a big pack. 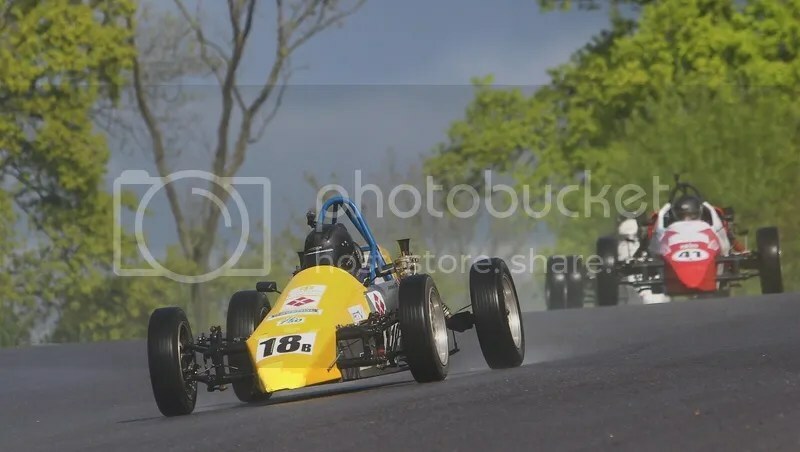 Andrew Crighton got a storming start and slipped past and I thought he’d be a pretty decent car to follow for a few laps to drag me up to pace. I got a monster slide out of Druids which I held but I lost ground on the pack ahead. I could see the red and white of Andrew Cooper behind me but still had a bit of breathing space. With all the spray it wasn’t a bad place to settle in for a while and get some laps in. 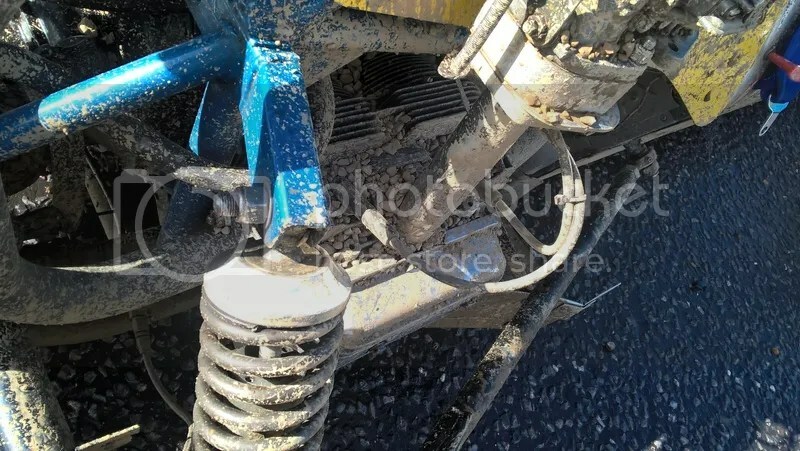 I was having to be very definite when changing to 3rd and 4th gears, but other than that the gearbox was holding up and it seemed that the days gremlins had finally gone. 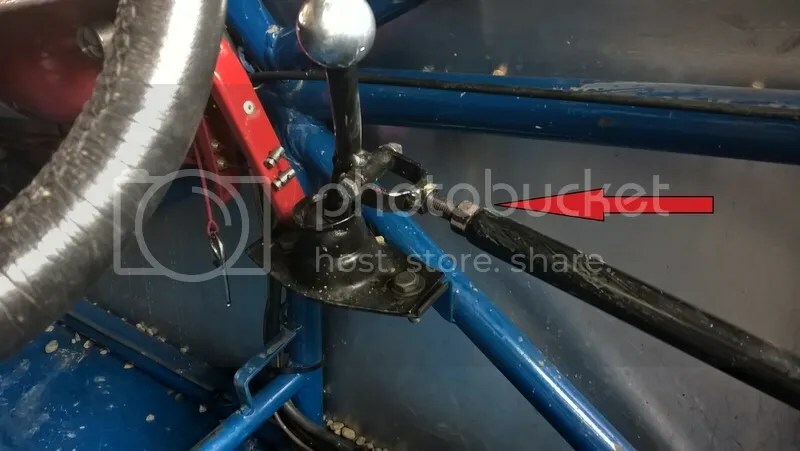 I eased the brakes on nice and early for Paddock Hill bend at the end of the first lap, and instantly locked up the rears. I was on a slightly high line and figured I’d just hit a bit of track that was more slippery. I became very aware of the wall straight ahead which was now very quickly looming closer, and gave a couple of quick pumps of cadence braking which didn’t seem to help anything. I realised I was crashing. 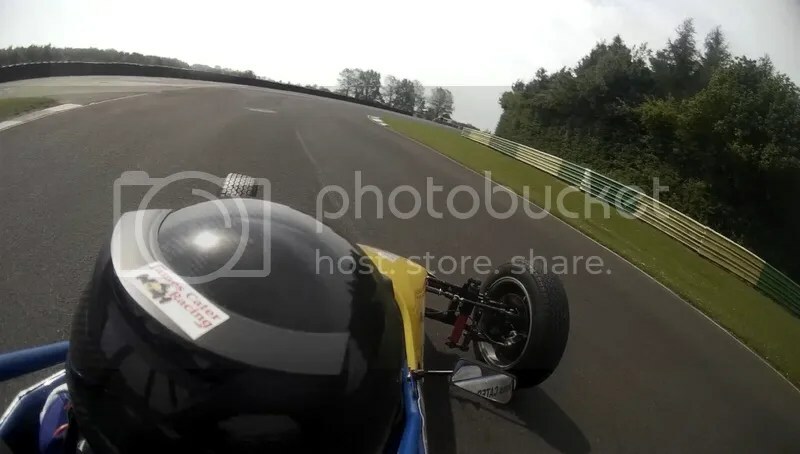 I really didn’t want to hit that wall, so got right off the brakes and flung the car to the right, then got lightly on the brakes to trail it in, not thinking I could make the corner in a million years, but preferring to spin it into the gravel over the crest of the track where I wouldn’t hit anything solid. The back end inevitably swung around, but to my surprise I caught it with opposite lock. Oh wow, I thought – I might make this! More gravel spewed over me and I realised I’d stalled and was reaching for the starter button before I’d even stopped moving, as my instincts kicked in. 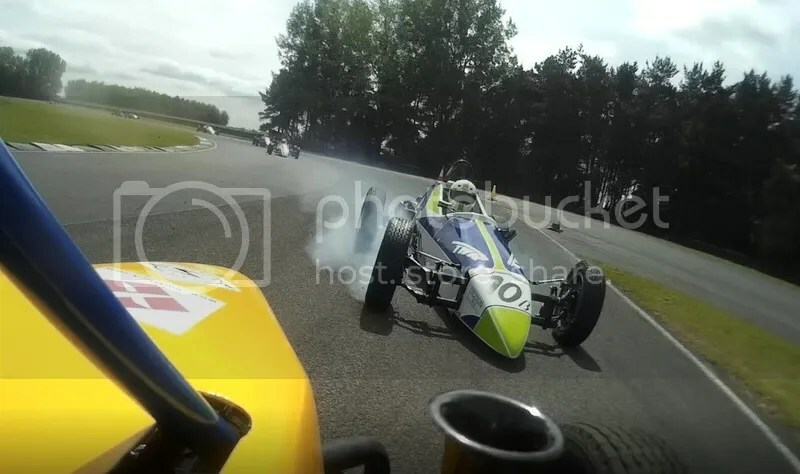 I was only a few feet into the gravel trap, so thought I could roll it out and get back on the black stuff. The engine didn’t fire up, so I gave the starter button another press and this time just got a clunk. My mind flashed back to the earlier spin and the lumps of gravel I saw down the carb trumpets. I also thought we hadn’t had the battery on charge all day, and there were several long delays to the start where I’d had to switch on and off. There can’t be a lot left in the battery after that? So once again I was towed back on the Wagon Of Shame and left to reflect on how much mess gravel makes, and how I’d paid £450 for maybe 2 competitive laps. Ouch. James Harridge had another theory about both my spins and that the cause was the same. 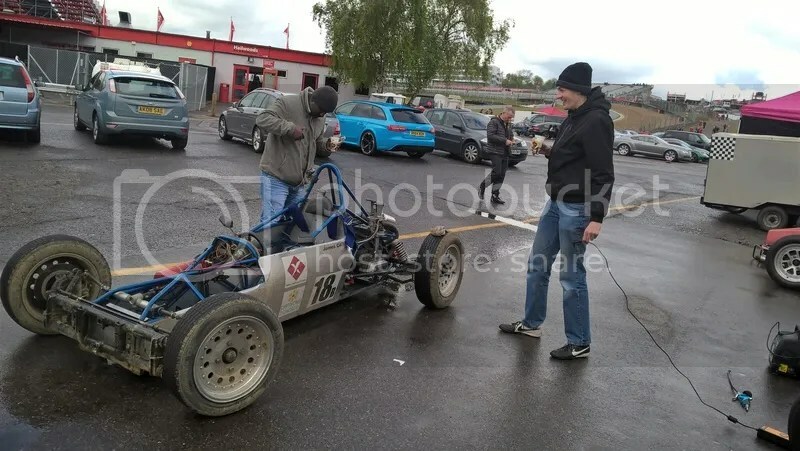 I’d been holding 4th gear through Paddock Hill, which is fine in the dry, but with the reduced wet speed I should really have been dropping to 3rd for it. This means I’d have been getting pushed by the 4th gear inertia as the engine braking would be a lot less than if I’d slammed it down to 3rd. 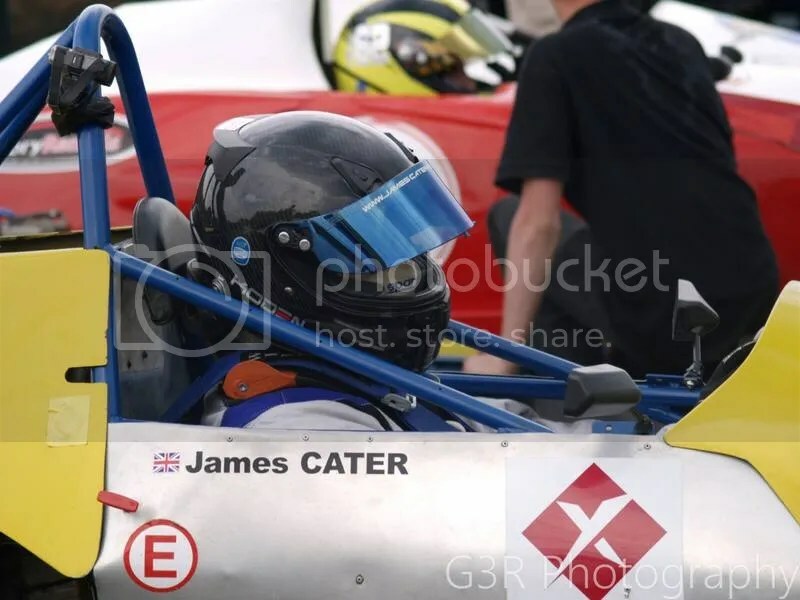 For the qualifying crash, although seemingly totally different, being in 4th on the exit meant that when the back end started to lose traction and I reduced throttle input, the engine wouldn’t have reacted as quickly as if I was in 3rd, resulting in the spin that I should really have been able to catch. 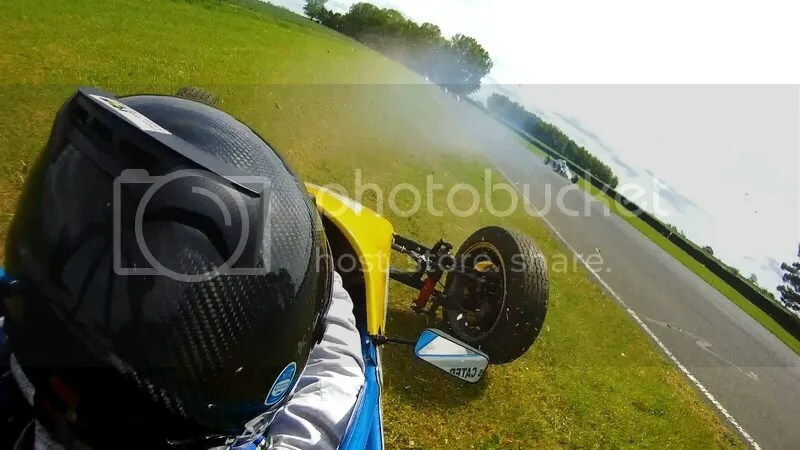 I can see his point – probably more for the qualifying spin than the second one, but still a bit of an ‘accident waiting to happen’ brought on by me. Who’d have thought cruising around a little would end up causing more problems than pushing? 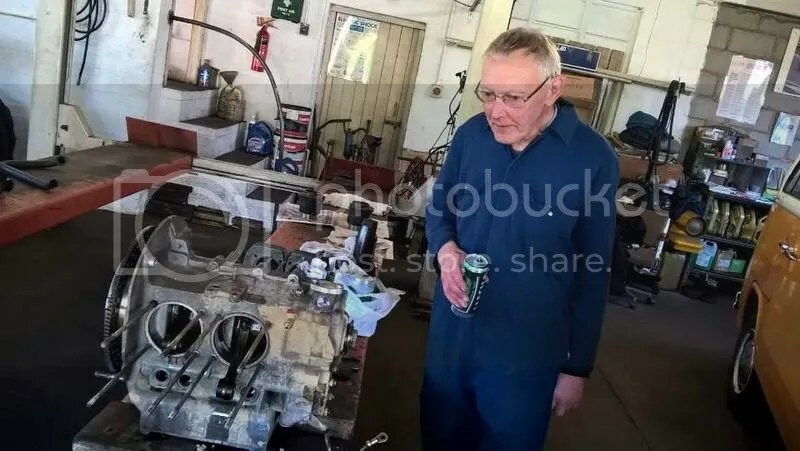 Now I’ll spend a lot of time cleaning the car up – time I can only see as wasted as Glenn and myself should be spending time getting the Ray and Scarab out on track. 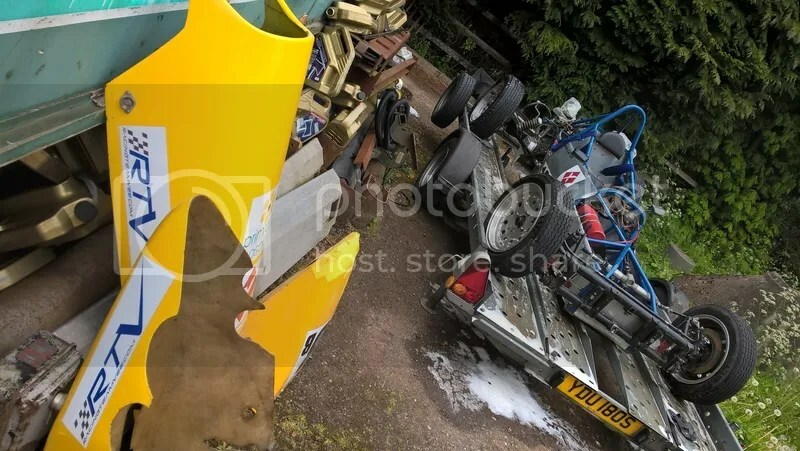 It’ll be a huge job as that car is absolutely covered and even after being trailered back home 200 miles there are many kilograms of gravel STILL inside and all over the engine. Once that’s looking better we can crank the engine by hand and find out if it has died or not. The legendary Brands Hatch GP circuit. Despite the ridiculous entry fee (£450 just to get in the gate! ), as soon as I saw we were getting a rare chance to race on the full circuit, I knew I had to do it. I thought it might also serve as a much-needed escape from stresses back in the ‘Real World’ away from racing – but as it turned out, it hasn’t helped much at all! We opted to make the 3-4 hour journey down to Brands on the morning, already knowing it would be a very tight and hectic day ahead. Within 30 miles the trusty VW Camper van started making a worrying rumbling sound all of a sudden. 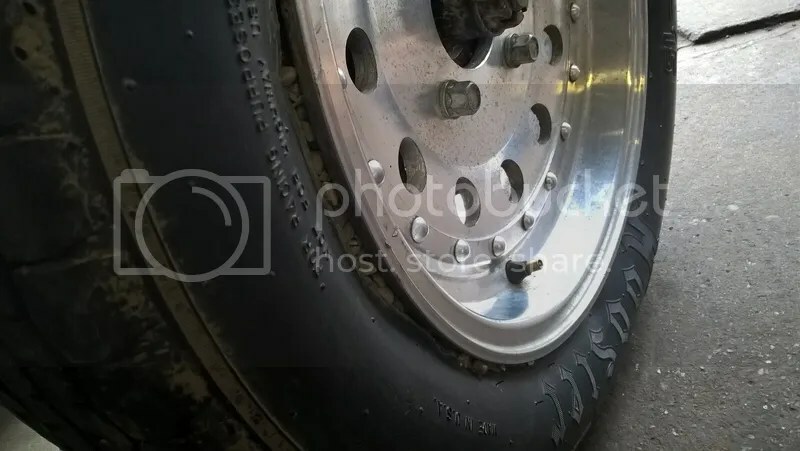 A quick check delayed us as we looked camper and trailer over to try and find the source, and after a few more miles we pulled in again to check the wheel bearings weren’t about to fall off… half expecting to have to turn around and go home. 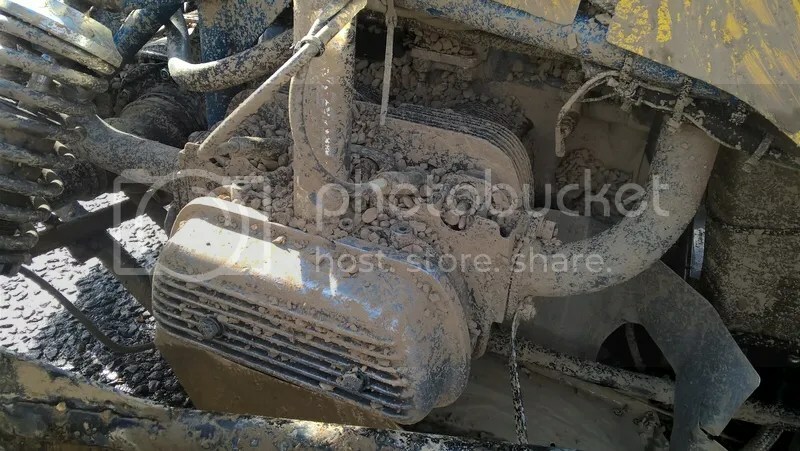 Luckily Glenn left the engine running as we got out, and it was soon obvious that the camper had blown something on its exhaust. Happy we wouldn’t die, we carried on. With light traffic the rest of the way, we made it there on time easily, and thought our luck had changed. We were wrong. True to form, the heavens had opened as we blasted out of the pit lane for everyone’s first ever lap of the full circuit. It was instantly obvious that it was really slippery, with everyone sliding around all over the place. 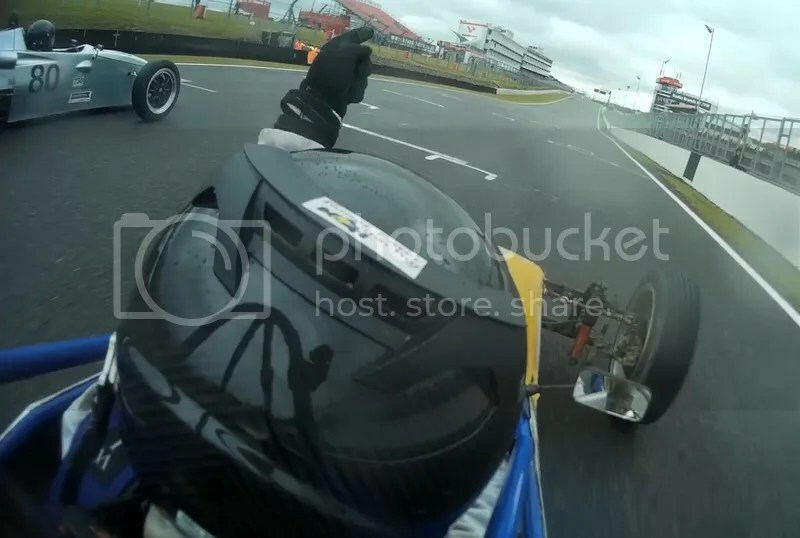 I followed Ben Miloudi through Clearways on a big armful of opposite lock, then we were both sideways on the power most of the way down the pit straight as there was just no traction to be found. The inevitable happened, and with cars off the safety car came out (still better than a red flag!) as the marshals cleaned up. 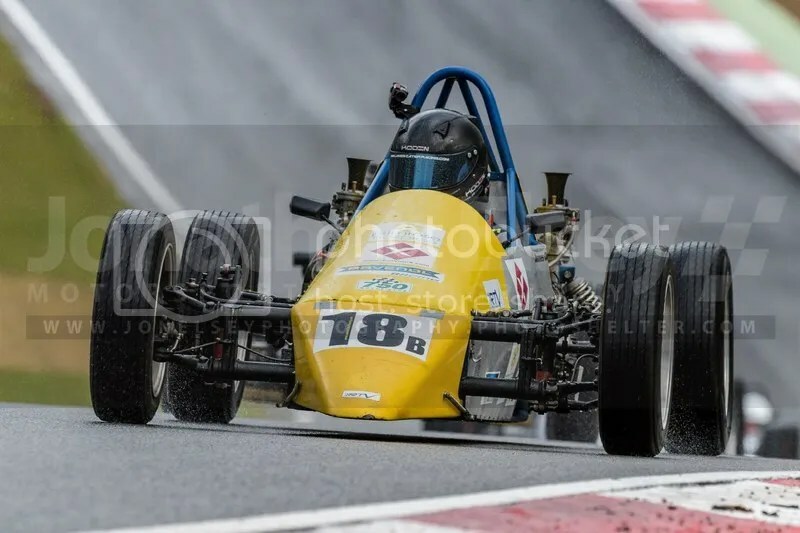 I felt pretty good with the car, but the excellent wet set up I’d found for Oulton wasn’t working for me at Brands. 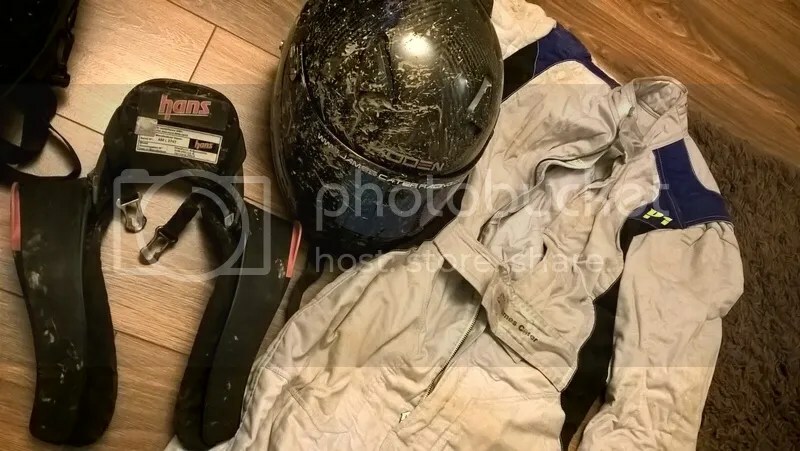 To be fair it was probably just too wet for anything to be of much use. The track, however, was fantastic! I’ve said before that Brands Indy is my least favourite track, but I do like the old GP section. I lose my favourite flat-out Surtees corner, but the new version is good an challenging, as is the new angle of attack for Clearways over the crest. I’m sure both would be even better in the dry! Anyway, the safety car… 750 Motor Club don’t normally use a safety car, so being with MSVR for the day was a good chance to see how it works. For the most part it’s great, as it keeps you moving and out of track, but I will come back to this later with some things that aren’t so brilliant. I never actually saw the safety car itself, as the group I was following didn’t catch up to it before we saw green flags. 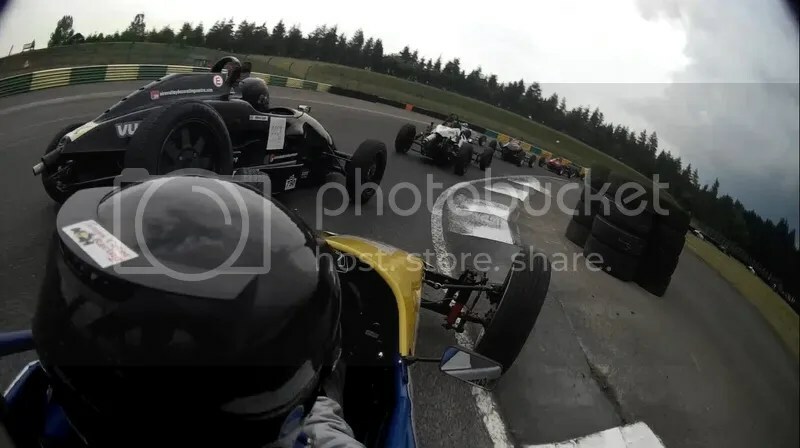 I got back on the pace, and a very quick Christian Goller slithered by I followed him through Paddock Hill and then got on the throttle a little bit harder and sooner down the hill, and the back started swinging around. 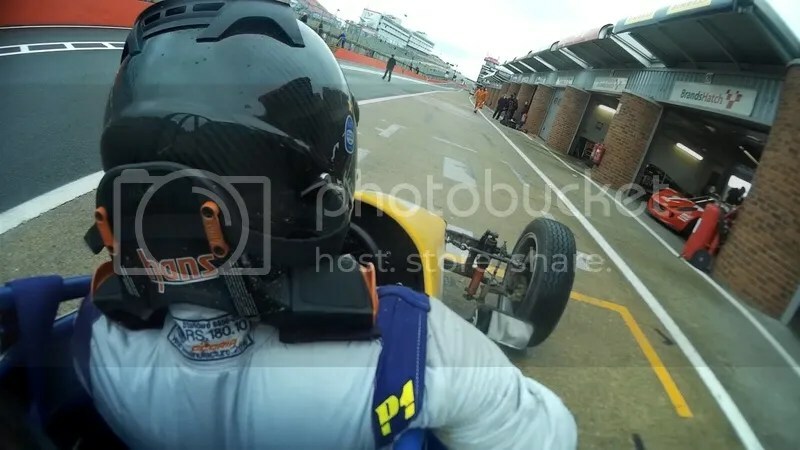 I made a huge correction on opposite lock but then the rear bit again and fired me sideways into the gravel trap, ripping my nose cone to shreds and showering me in gravel as I stopped just shy of hitting the tyre wall backwards. I tried to drive out but that was hopeless as I was virtually buried. I even had gravel on the inside of my visor! I switched off and jumped out, marvelling at how covered the car was. 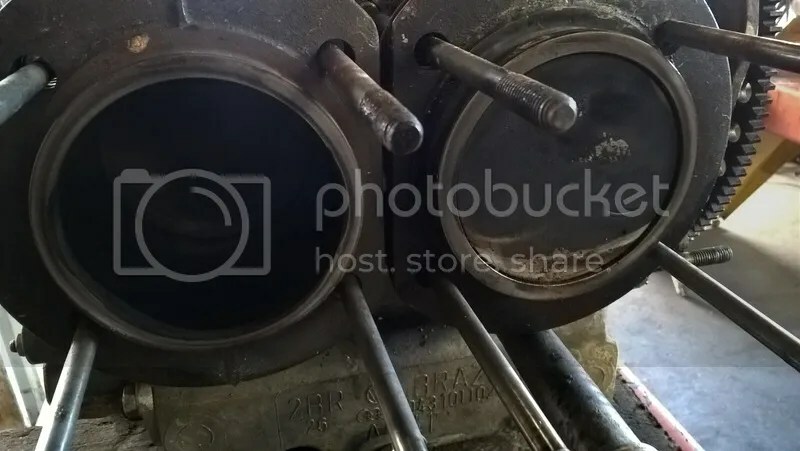 I’d also taken a quick look inside the carb trumpets, and could see lumps of stone there waiting to get into the engine, so I had to wait until the session ended to be towed back on The Wagon Of Shame. Of course, the rain stopped just as I needed it to clean the car off! I need to give a special mention here to Chris Whitehouse and Vinoth Kumar who did an excellent job of cleaning the car up, and also to Dave Jordan for the loan of a vacuum cleaner to get gravel out of the car – without them we’d have no chance of making the start of the race, so it was hugely appreciated, and yet another display of the Vee crowd pitching in to help! Oh, and despite all the drama I’d somehow still qualified 18th and 16th for the races! James Harridge took pole by about 4 seconds from Ben Miloudi and Steve Ough.